It is so easy to get confused when you have a large Magento store with dozens of managers, representatives, and a huge product catalog. If you are constantly facing the problem of controlling and monitoring your employees, Amasty team can offer a great solution for you! Keep everything under control - create and edit numerous sub-admins, endue them with necessary accesses. For example, grant sub-admins access to the deep e-commerce analytics provided by the Magento reporting tool. Put specific sub-admins in charge of particular categories. You can let admins view all the Magento shop categories, but they will be able to edit only the certain ones. 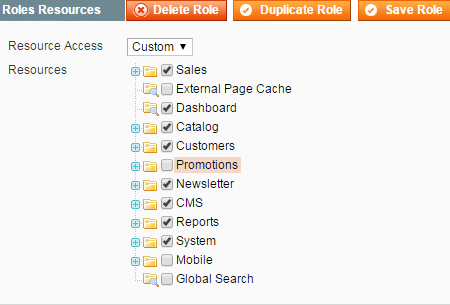 Save your time and duplicate roles, using ‘Duplicate’ button on the Role Edit page. The user role will be duplicated with all existing Magento 1 role resources. It is much easier to duplicate roles, nor creating new ones from the beginning. Limited access lets your Managers restrict the access to particular CMS elements for different admin roles. Our Magento 1 user management module is fully compatible with the majority of third-party extensions. Store-view/website limitations will be automatically applied to the instances, provided by other extensions. Limit the access to reports depending on sub-admins roles.The option will help you to keep your store data safe and properly updated.This option let your Managers work with the relevant Reports (e.g. customers or sales). For example, the marketing manager will see product report with bestsellers. Advanced Permissions module enables Super-admin to choose which products can be edited depending on the store view/website. Give your managers a limited access to the Dashboard statistics with the Magento catalog permissions tool. This option helps sub-admins to be aware of important store data. Is the number of admin users created with this module limited? Our Advanced Permissions extension supports an unlimited number of admin users. Can the extension restrict users to manage the catalog by store view/website? Yes, you can make user's access denied, as well as create users with advanced roles/permissions. Define website/store view a sub-admin will have access to at the 'Advanced Permissions: Scope' with the following guide. Can I let an admin user see only the orders created in a particular store view? Yes, sure. Our Advanced Permissions extension is highly customizable so that you can control an access to any area of your Magento as well as the types of the actions that can be performed by each admin role. Read on to make all the settings correctly. Can I give users an access to sales data for specific products/categories? Yes, you can do that. Just choose what particular sales data you want to open for viewing (order, sales reports and/or sales section) in System > Permissions > Roles > Role Resources. Category and product access can be configured on the Advanced: Categories and Advanced: Products tabs respectively. How can I let an admin manage only the products created by himself? This is easily achievable with our extension. In System > Permissions > Roles > Advanced: Products you can either choose items from the grid or just set “Allow Access To” to “Own Created Products”. This is really handy if you have, for example, multiple suppliers and want them to access only to those items which have been created by them. Can I set view only permissions for the product catalog? 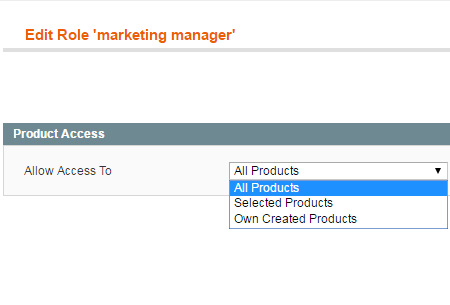 Yes, you can enable the view only permission for your Magento admin at the 'Role Resources' tab. Continue reading to make it on the first try. Is it possible to restrict access to customer data? Yes, you can restrict access to customer data making changes in the Role Resources section. Go on reading to see the instructions. The functionality is sufficient for distributing roles for a big store. Our team has been using the extension for 6 months and had no troubles. We would be happy if you could include restriction by IP address, that would be very helpful. Thanks. Module is good and does what it promises, however it took me hours to configure it. I’ve been working with Magento for years, but still felt uncomfortable. I tried to make some coding to adjust the module and ended up asking a support team for help, and they coped with all issues within 3 hours. On the whole, the module is pretty good for adjusting the admin interface and lives up to expectations. Nous avons plusieurs départements et de nombreuses personnes travaillant sur le site simultanément. Chaque équipe est responsable pour des choses particulières. Précédemment, nous avons eu quelques problèmes de temps en temps parce que certains employés ont changé les réglages importants par erreur. Une hiérarchie claire des autorisations d'accès est une bonne solution dans ce cas. Avec cette extension, nous avons réussi à donner aux gestionnaires les autorisations dont ils avaient besoin pour leur travail. En conséquence, le nombre d'erreurs a remarquablement diminué. I have a multi-store shop and 5 users that are managing products and orders. 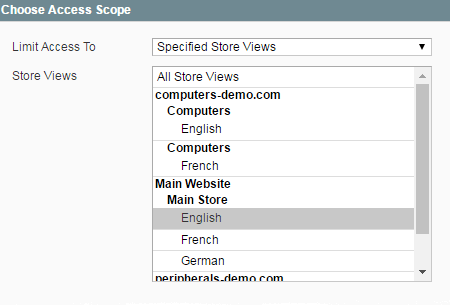 Each user sees only its store view and domain resources. With this extension I solved all the issues concerning the situation when several people are working in the same store simultaneously. At present there are no confusion, no mistakes. It works nice and restricts all kinds of activities for those who work with the store. No bugs or any issues whatsoever, no conflicts with extensions of other vendors as well. Actually the main reason I leave this feedback is that I ask to add IP restriction to the roles as well. I know that they have a separate extension with I P restriction – so maybe just add integration? That would be very helpful and will add to our shop’s security. Thanks. We have 3 teams based in different locations (Italy, Spain and France) so it’s very hard to control all the changes made from the admin panel. We used to have some products deleted accidently and other unpleasant things. So controlling which site area will be available for each team is a real solvation for us. Our employees are experienced but things happen, you know. The thing I like most is duplicating roles, it’s so easy, I just don’t need to think how to create each role again, I did it once and then only need to copy the rule and assign it to a new admin, very handy. I would be even more happy if actions log came as a feature of that extension but not as a separate module (yep, to save money). But in general, I’ m happy with the features. We have 5 departments and many people working on the site. Each team is responsible for particular things. We used to have problems from time to time as some employees could change important settings by mistake. A clear hierarchy of access permissions is a good solution in that case. With this extension we managed to give managers only the permissions they needed for their work. As a result, the number of mistakes has remarkably decreased. We found a few bugs while using that extensions, now all of them are fixed thanks to Amasty support. This extension ROCKS. I am amazed. First to say - it is written as module should be written! Clean code and readable for semi-developer. I already made some adjustment - and it is sooo easy to do it. Just installed the plugin. I can't call it's intuitive, as I had to reread the manual at least twice to find out the way to set it. But in the end I got a perfectly organized system with custom permissions for all my store views and numerous vendors. We run this extension on 3-lingual store. A very good way to give each translator possibility not to make mistakes when editing products. This also works great with Admin Actions Log extension from Amasty, so I can assign permissions, and see what people are doing. Nicely done. – New: added the ability to limit users' access to the new users and roles creating. Now, the store admin with the limited role can add a user with the same role but won't be able to create a new user with the SuperAdministrator role. – Fixed an issue with the order restriction. – Fixed an issue with the sorting by store feature in the order grid. – Fixed a situation when option values from restricted stores were deleted after attribute save. – Restrict attribute options deleting if current admin has restricted store scopes. 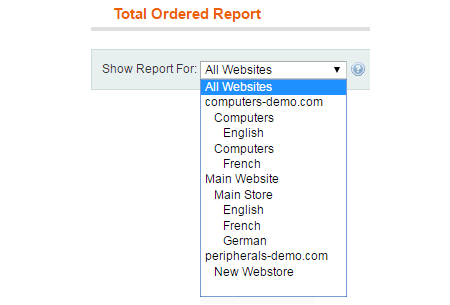 – Fixed restriction by stores for reports. – Fixed store restrictions for Store Credit on customers grid for action Update Credit. – If an admin user creates a new sub category, it receives the same view permissions as the parent category.